There's a New Cat in Town....Some Exciting News! Happy Monday everyone! And for some of you, happy Spring break! I am here to share with you some exciting news... I am now part of the Cat Pack over at The Cat's Pajamas Stamps! I am so excited to be part of this team and work along side these talented ladies. Some I have had or currently have the opportunity to work with before, and others, it will be a new experience. I have longed been a TCP fan and have known Alma for years. I've always wished to be part of her fab team and of course did not hesitate when asked. Her stamps bring in the both the cuteness and humor that many have come to love, including me, and so many options of what you can make with TCP stamps. To debut my day as part of the Cat Pack, I have created this card using the newest release set of Space Cadet and the fun wavy stitch border die. The sentiment was stamped on the Framed Up die set and tucked behind the panel of the stitched wave. The image was stamped and colored in with Copics and popped up, while the card was completed by added some rhinestones to a few stars and sentiment. Meowy thanks Alma for inviting me to join your fabulous team and can't wait to see what is in store. Thank you to my readers for sharing in my news and can't wait to share with you future projects! Have a great Monday! 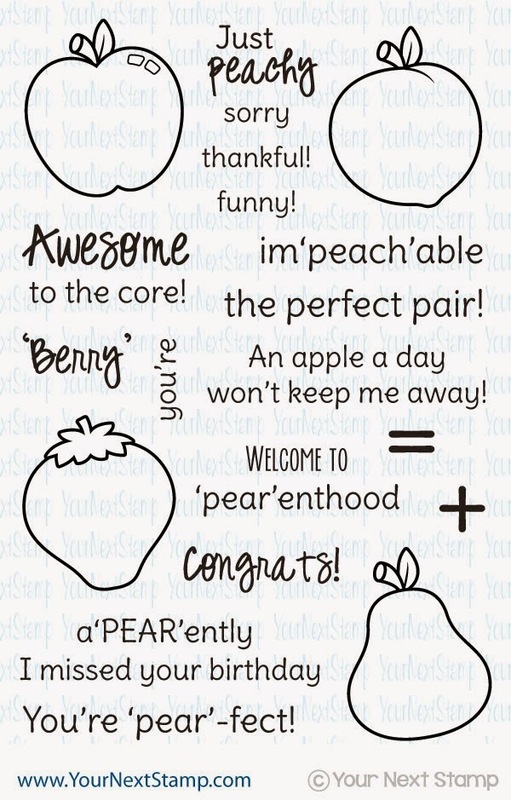 Just wanted to pop in to share with you a quick card with you for today's Friday Fun Project using the fun Your Next Stamp set of Fruity Fun. Using the current sketch from the YNS Challenge blog, I used Fruity Fun for a CAS card paper piecing the image. I cut out the image once stamped on the patterned paper and then used the coordinating dies to cut out the shape on a separate piece of card stock before gluing the image to that. Also using the Create a Character set, I stamped the face to the apple directly onto the patterned paper and used my white gel pen to color in the eyes and shine portions. The apple was then popped up while the funny sentiment was stamped onto the panel below. The look was completed with some fun orange sparkled gumdrops. Thanks for taking a look and hope you have fabulous Friday! Today is Feature Day over at Your Next Stamp where the DT is show casing a card or project using the theme of Think Spring . Perfect now that Spring has FINALLY arrived! Hopefully you have had a great start to the season. For my card, I am using the fun die set of Cute bike and kite. This set instantly makes me think of Spring and of all the fun outdoor things to do. I coordinated this die set with the Puffy Cloud die set, Stitched line die, and the stamp set of Whatnot Sentiments Four. I finished it off with some mini flowers in the basket that I have had in my stash for a while now and the patterned paper used is from Studio G.
While you take a gander at all the fabulous projects on the YNS Blog, don't forget to comment for your chance to win a stamp set of your choice! Thanks for stopping in! Yesterday was the fabulous March Release of The Cat's Pajamas Stamps. Head over now here to hop along on the blog hop to see the fabulous creations of both the Cat Pack and some recent Swanky Stampers. I was one of those recent Swanky Stampers, but was unable to participate in the blog hop. However, I am posting now what would have been my project for it. This set is called Way To Go and is FREE when you spend over $60. It is such a darling set with the perfect sentiment's for your graduate. One of them says, "Now get a job!" I love it!! :) I followed the TCP blog hop sketch and used some fun gold mirror card stock for the gold, white, and black look. I completed the look by using some patterned paper from MME, some sequins, and stamping the sentiment in white ink. To darken the white a bit, I went over it with my white gel pen. Don't forget to check out the TCP Blog with all the details of this release and to see all the fabulous projects!! Thanks for stopping by! 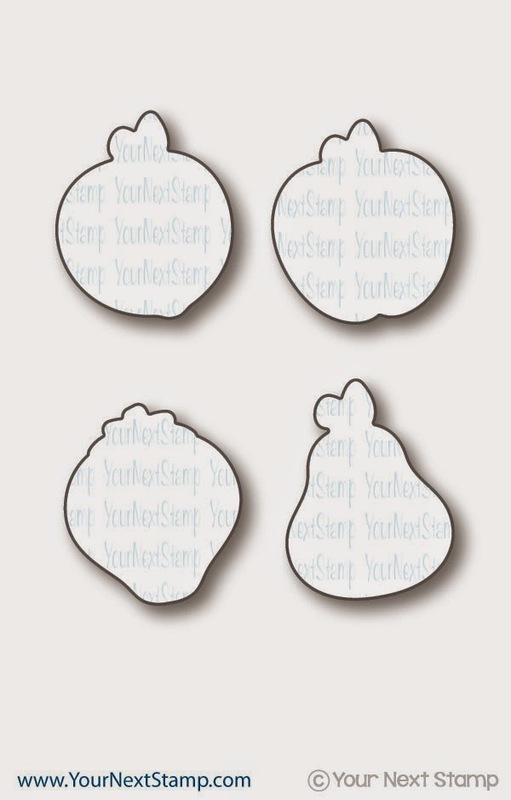 Today is day 4 of the Sneeky Peeks for The Cat's Pajamas Stamps and I have a slider card to share. This image is so cute and perfect for a wavy slider card, I also decided to use the new stitced wavy die as the base to my slider and the negative portion of that as the top slider base. I used some patterned paper from MME's Adventure collection for the sun burst while using some heavyweight cardstock for the slider base and image. The image was fussy cut around after coloring it in with Copics. I also used the TCP cloud border die and cut it up for seperate clouds to be popped up on the patterned paper. The sentiment was stamped directly onto the patterned paper. It's really cute when it heads down the card as you see in the picture leaning to the right where the bird sits as if the bird makes it too heavy on that side. 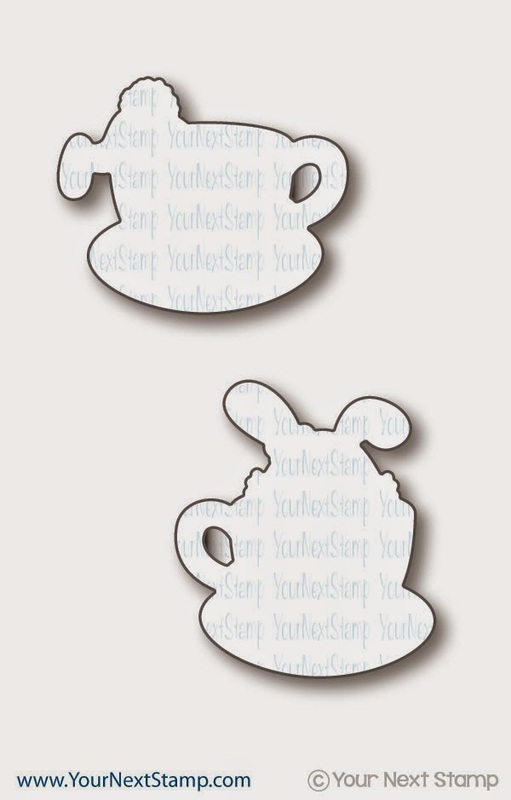 :) Be sure to stop by the TCP blog for more fun DT sneeky peeks and information on this set. Thanks for stopping in! Have a great day! A quick card I made for today's Friday Fun Project over at YNS is using the new release set of A'dork'able. It really is just A'dork'able! 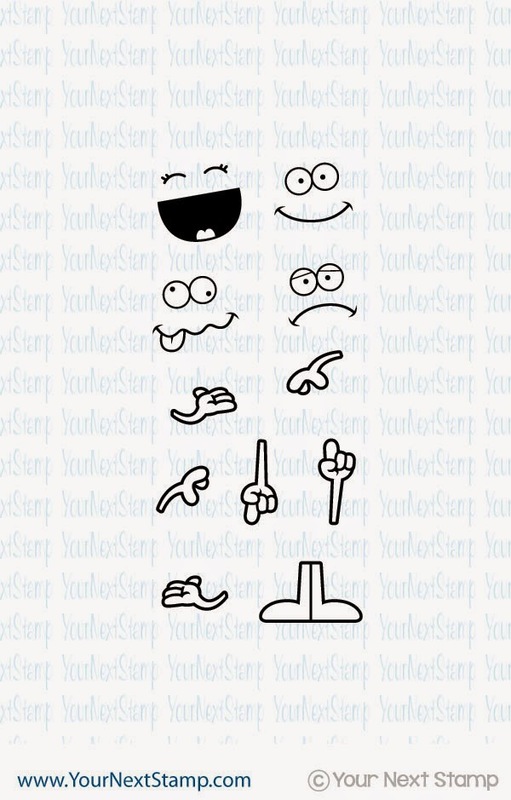 Look at all the fun images and sentiment it contains. Using the current YNS sketch, I turned it around and popped the image up after coloring it with Copics. The patterned paper are from EP's That's My Boy collection. The sentiment is stamped partially on the popped up circle and directly on the patterned paper. Those cute glasses were fussy cut out and the centers popped out using my 1/4" circle punch. This set is so super cute and can't wait to color up the little girl! Thanks for stopping in and taking a peek and be sure to stop by the YNS blog to see all the other DT's fabulous creations! Today is day 3 of the Sneeky Peeks for The Cat's Pajamas Stamps. Have you had a chance to check out the last 2 days? If not, check them out here. Today I am sharing with you an altered box and matching card using the new set called Patterned Petal. There are so many ideas of how this set can be used and I decided on making this box. This box I had for a while sitting around my stash of alterables and thought it would make for a fun box with this set. I used Basic Grey's collection of Sultry for the papers used and inks from Memento. The window in the center was made as a "shaker" type having some rhinestones in it. Using paper from the collection and a sentiment from the set, I created the center window. The top was decorated using the stamps and coordinating die set to decorate around. The flourish is a beautiful large one that has lots of possibilities, but I decided to break it up a bit for a different look. The center of the flowers are popped up and popped up around the frame and rhinestone flourish. To complete it, sequins and larger rhinestones were added. The legs for the box were made using some repurposed wooden thread spools that I hot glued to the bottom. The sides were decorated using some pleated ribbon to be attached all around and large rhinstones added to each corner. I kept the inside pretty simple so it can be used for various things and not have the opportunity to have whatever is placed inside get ruined. I stamped anotherh sentiment from the set on the inside lid and added a small ribbon to act as the handle to open the box and a button for another element. The card I made was to mimic a bit of this box having the same window center look. I hope you enjoyed todays peek and thank you for stopping by. Don't forget to check out the other fabulous designs from the Cat Pack here! Have a great day! Today is day 2 of The Cat's Pajamas Sneek Peeks! I hope you enjoyed in seeing the fun creations from the Cat Pack yesterday with Space Cadet. Isn't that set fun? Today I will be showing you a card made from a new illustrator and the set is called Hear Me Roar. How cute is this guy?! I paper pieced the main image with some plaid patterened paper and colored in his mane with Copics. The flowers, bee, and eggs were also colored with Copics and fussy cut to be popped up around. The sentiment was stamped directly onto the main layer. The background patterned paper is from AC. Be sure to stop by the Cat Pack blogs to see more fun designs with this set! Thanks so much for stopping in! It's the YNS DT Dare today! 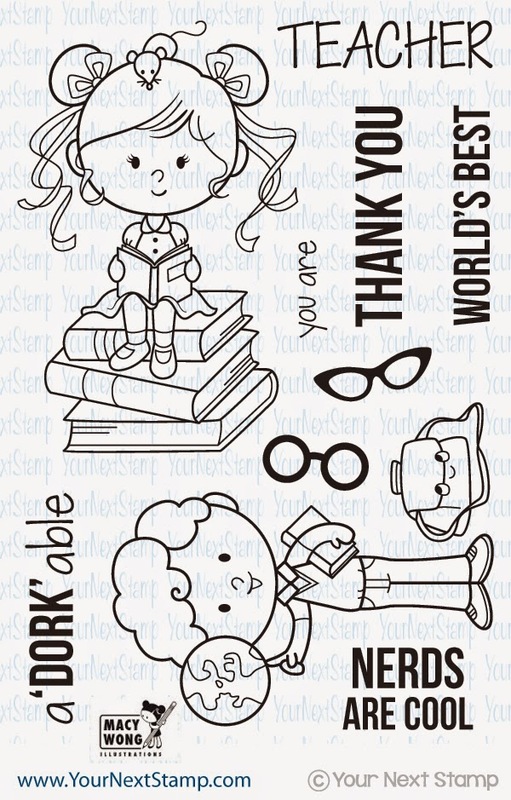 That means some fun and adorable eye candy for you to comment on and have a chance at winning a stamp set of your choice just for commenting! Our dare is using stripes and/or dots with one of the new release sets. For my card, I am using A'Dork'able. How can you not love it? I colored the image with Copics and seperated the bag to be placed off to the side. You can't see it very well, but I added a "band aid" to the center of his glasses for a little fun and popped it up after punching out the center of it with my 1/4" circle punch. I followed Mojo Monday's sketch from last week and some patterned papers from EP That's my boy collection. Don't forget to stop by the YNS blog to comment and check out the other fabulous projects from the DT! Thanks for stopping by! I am excited to be able to play along in the Sneeky Peek Week for The Cat's Pajamas.There are some fabulous sets to be released next week! Over the next 7 days, the Cat Pack will be showcasing five new stamp sets including one from a new illustrator, four new dies, two new Cutables, and a bonus stamp set that is free with a $65 purchase. Today's peek is one called Space Cadet. Super fun and makes me crack up. Be sure to check back tomorrow for another peek of another set to be released! Thanks for stopping in and taking a looksey! You know what is amazing?! It's release time again with Your Next Stamp! Woot! I guess because February was a short month, it feels like we just celebrated the ever popular February release. Well, can I just say that this is ANOTHER fantastic release for March you don't want to miss? I know I say it every month, but really... Karen out does herself every month. There is lots of cuteness and some fabulous new die sets created by our own DT member Maureen! You have to check it out. 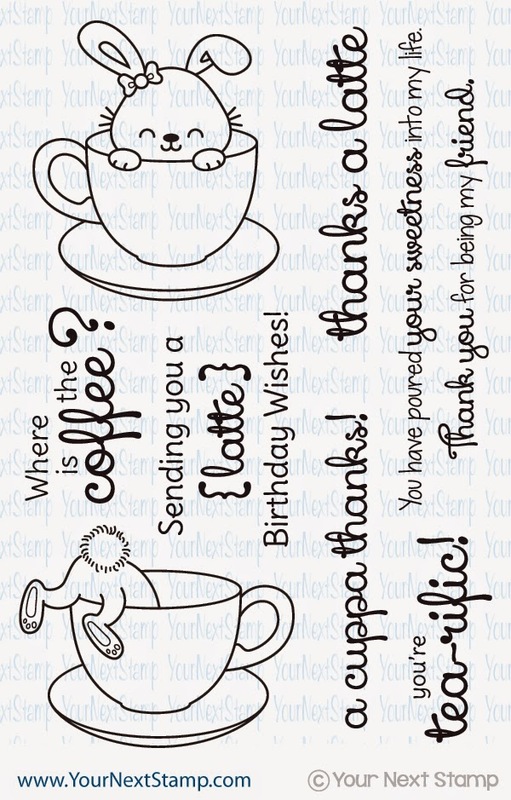 First up is a card made from the new set called Sprinkles and Coffee. A perfect set for me and it's just adorable to boot! This set has a coordinated die to accompany it and make for the perfect coffee project. I used both the Plain circles die set and the stitching marks circle die for the image, popped up, and finished with some rhinestones. For my second card, I just had to make one using this image and sentiment, because really, if I had to look that far into my mug, I would ask the same! This just makes me giggle. I used the current YNS sketch and cut out the image with the coordinating die set. Instead of a circle, I used my tiny attacher for the top corner. Now is the time to stock up on some of your favorites along the hop that you've seen because there is a fantastic deal happening with the release. 15% OFF your ENTIRE purchase! 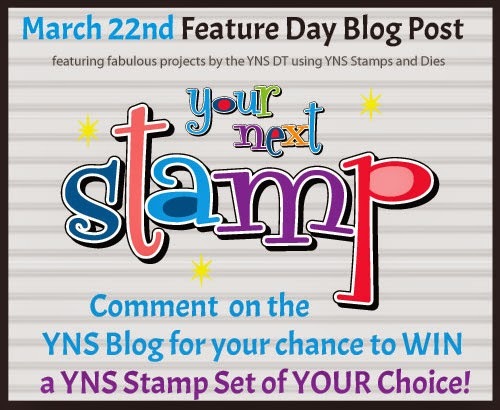 And don't forget to comment along the way for your chance to win a $20 YNS gift certificate. Thanks for stopping in and happy hopping! Are you ready for this months dose of cuteness for the March release of Your Next Stamp?! This is another fabulous release, (I know I say that every month, but Karen keeps just having these wonderful releases!) and today I am going to give you a sneak peek of what is to come. This super fun set is called Fruity Fun and coordinates perfectly with Create a Character set and die combination. It makes for some really creative and fun notes or cards. For this, I colored the image with some Copics and cut it out using the coordinating die. Additionally, I used the Create a Character set and dies for the face, arms, and legs. He is popped up over some scraps that I tore at the bottom and used my distress inks and a stencil from Crafters Workshop for the background. It was finished with some Gumdrops and sentiment. 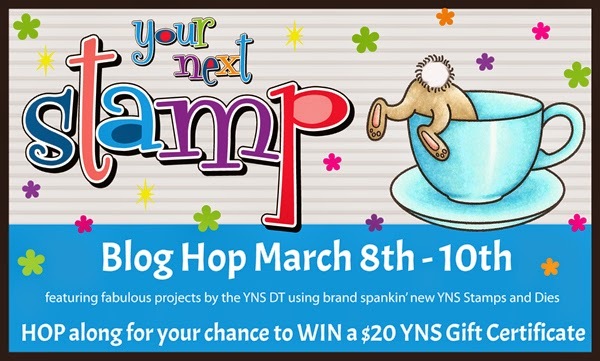 Be sure to check back tomorrow for the fun new release Blog Hop for your chance to win some YNS goodies and check out the other DT sensational sneeks on the YNS Blog they have created! Thanks for stopping in! 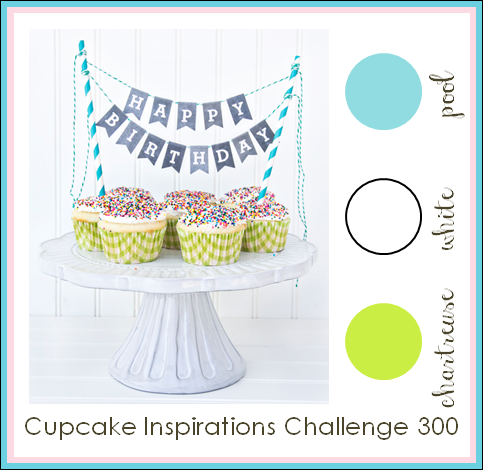 Your Next Stamp is one of many fabulous sponsors for the Cupcake Inspriations 300th Challenge! They have 3 super fun challenges you can link your project to and have a chance to win some fantastic prizes from some of the amazing sponsors! I used some cardstock from PTI for the base and the green from SU!. The image is Your Next Stamp from their Tea-riffic set and paired that with YNS open scallop dies for the banner topper. The sentiment is a new release set of What Not Sentiments Four, finished with some YNS Gumdrop embellies. Be sure to check out all the challenges and fabulous projects from various DT's from the other sponsors on the Cupcake Inspiriation blog. Thanks for stopping by! For my card, I went simple and what speaks to me with that cup of warmth and love. Using a die from Memory Box that I recently picked up, this was a perfect time to use it. I thought using some scraps, torn on one end, and placed just "about," would give it a different look to be a little unique. The coffee cup is popped up and I completed the look with a scripty word from Your Next Stamp and some Your Next Stamp Gumdrop embellishments. A quick and fun card to support this fun hop, sponsored by some awesome companies! Thanks for taking a peek!